A pendulum is used to set the rate. 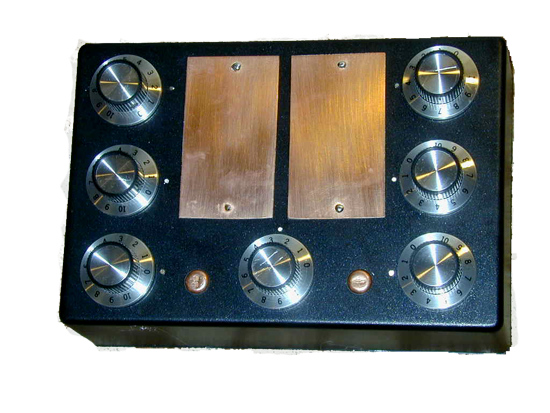 This is a seven dial Radionics mind machine, no batteries or electricity. It is not advisable to introduce negative energy like electricity or batteries see this. 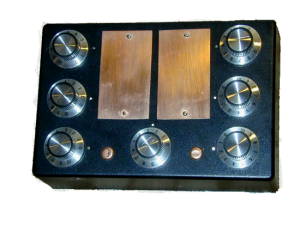 The components inside the radionics machine are one large Orgone beamer matrix unit. A laser crystal wire wrapped along with a vile of pure water. For added energy Herkimer Diamonds are incorporated with in the Orgone matrix unit. A full instructions booklet for use of the Radun701 is supplied. Radionics incorporates the power of your mind along with physics in a continuous stream of manifestation consciousness. Manifesting is accomplished by everyone every day of our lives on auto pilot, but the trick is to influence that manifestation with things we want and not settle for what we are programmed to do. You may ask who is programming us. Simple we are by our thought and beliefs which are thrust upon us. Who pushed these thoughts and beliefs on us? Parents, siblings, friends, teachers, education, colleges, family and governments the list is endless. Who can say that their thoughts and beliefs are 100% their own and not influenced by other people or circumstances? Life and advances in technology should be becoming simpler not more complicated as it seams to becoming. We are not aware of our past where life was simple, and everything was created by our minds and crystals without pollution and damage to the planet. Every single point in space and time has an exclusive vibratory frequency of reverberation. When you equal the vibrational rate and resonance, you create a undeviating association with that sauce point. This is enabling a vibrational link instantaneously to have the ability to influence thoughts and beliefs for an advantageous outcome. Unlike our tiny attention span, radionics is able to broadcast the required frequencies on a 24/7 basis, like a hard wired connection to our inner manifestation portal. The Radionics Machine is not capable of knowing the difference between positive and negative. The machine can be used for right or wrong, but if the later there will be karmic issue to face at some time. A toy this is not. When making requests of the machine be precise and so very accurate to achieve the end result you require. With the Radun701, there are 2 copper domes which allow you to make contact with the machine by placing a finger on one dome and another finger on the other dome. You are now part of the circuit and have the ability to influence the memory of the box, so be very careful what you think, only think positive thoughts that don’t conflict with the original programming. We all manifest on a daily basis; we just don’t know what we are asking for. It is more than likely things that are suitable for our journey, but they may not fit in with our physical plans. With Radionics, you are able to make things happen that you want on this physical plain. You possess the capability to start your own new journey and manifest what you want with radionics.